This Certification Study Kit Bundle contains the course materials for three Blockchain modules you need to complete the Blockchain Architect program and prepare for the associated exam required to attain the Certified Blockchain Architect accreditation. This study kit bundle is currently available at a discounted pre-order price. When this product is released, the regular price of $717.60 will go into effect. These Study Kits are offered together at a 20% bundle discount. 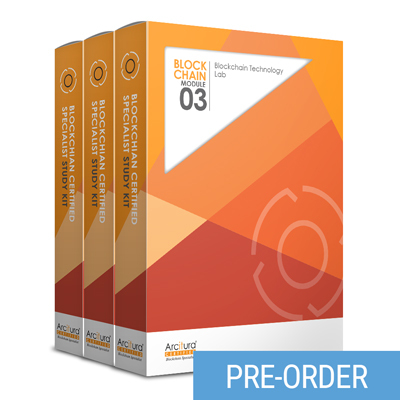 For more information about this Certification Study Kit Bundle, visit the Blockchain Architect Certification Study Kit Bundle page. Also available are optional add-ons for the purchase of the associated exam voucher and eLearning Study Kits. The exam voucher add-on is for a pre-paid Pearson VUE voucher for Exam BC90.01: Blockchain Specialist. The Blockchain eLearning Study Kit Bundle add-on provides on-line access to course materials and media content for one year. This Study Kit bundle includes a set of Audio Tutor recordings that provides supplementary guidance for the course workbooks. You will be able to download these audio files upon purchasing the Study Kit bundle. As per the Order Option checkbox above, you also have the option to have each file included on a separate physical USB drive as part of the Study Kit contents, at no extra charge. Please note that in some regions, including the USB drives in the shipment can incur an additional customs fee, as the shipment can no longer be classified as being comprised of only printed or paper-based materials.